Palikir, Pohnpei, March 17, 2016: President Christian received a visit from Ambassador Extraordinary and Plenipotentiary of the People’s Republic of China, H.E. Li Jie. The Ambassador paid a courtesy call on President Christian to inform him of the forthcoming Chinese assistance to relief efforts currently underway in response to drought conditions resulting from El Nino. These drought conditions were the subject of previous discussions between the President and the Ambassador, wherein the President welcomed any assistance that the PRC might be able to provide. The Ambassador thanked the President, Vice President, and cabinet members for their time despite their busy schedules. He further expressed his pleasure to report that as a result of those previous discussions, and the two countries’ close working relationship, the Chinese Government has mobilized support for the FSM. The forthcoming support package is 10 million RMB worth of equipment specifically to address and mitigate the effects of the drought, and includes: seawater desalination equipment, portable generators, and water storage tanks. Ambassador Li stated that this is by far the largest contribution from China to the FSM for disaster relief. He further indicated that the assistance package would be delivered to the FSM Government via chartered aircraft delivery, for further distribution to affected areas at the discretion of the National Government. President Christian expressed his great appreciation to Ambassador Li and the Government of the PRC for the generosity and timely response to FSM needs. He further emphasized the importance of temporary technical support to assist the FSM with familiarization of equipment operations and maintenance. President Christian thanked the Ambassador once again, and promised to share a drought assessment report with him once it was finalized and available. For further information on this release, please contact Department of Foreign Affairs at (691)320-2613. .
Palikir, Pohnpei – Roger Mori, former Trade Adviser to the FSM Department of Resources and Development, was sworn in during an official ceremony as the new Deputy Chief of Mission (DCM) to Japan by President Peter Christian at the President’s Conference room. During the ceremony, President Christian, who administered the oath of office expressed his congratulatory remarks by noting his confidence in DCM Mori’s abilities and experience as he takes on his new role in Tokyo, Japan. President Christian acknowledged the contributions he has made to the National Government over the years and believes that through his enthusiasm and willingness, DCM Mori will contribute to further develop friendly ties that exist between FSM and Japan. In return, the newly appointed DCM expressed appreciation by thanking President and the Leadership for the confidence for entrusting him with the responsibility of his new appointment, assuring President that he will carry out the mandates and policies of the Administration that would promote and continue the good relations that exists between the two countries. The 19th Congress confirmed his nomination in February and he is scheduled to depart to take up his duties at his new post on March 19th. Present during the brief ceremony were DCM Mori’s son, Scott Mori, members of their family, Secretary of Foreign Affairs; Robert Lorin, Secretary of Transportation, Communication and Infrastructure; Lukner Weilbacher, Secretary of Health and Social Affairs; Magdalena Walter, Secretary of Department of Justice; Joses Gallen and staff. Palikir, Pohnpei - Despite the recent Congressional action revoking the President’s Declaration of Emergency and a decree of emergency funding for severe drought conditions nationwide, there remains an urgent need to assess and mitigate the effects of El Nino in the Federated States of Micronesia. In response to this urgent need, the FSM National and State governments are collaborating and continuing their efforts to visit the outer islands to assess the impact of prolonged drought conditions. Upon completion of this assessment phase, the governments will know better how to help ensure that people living on the islands have adequate drinking water to carry them through this reduced rainfall period. Thus far, the El Nino drought can best be characterized by prolonged periods of very dry conditions, punctuated occasionally by short periods of rain shower activity; however, the cumulative effects of these dry conditions are still cause for legitimate concern and continued vigilance. The Patrol Boat FSS MICRONESIA has visited Ngulu Atoll, the westernmost outer island in the federation located between Yap Island and the Republic of Palau, and is continuing its visit to the islands moving east from Yap to Eauripik and then further on to other outer islands of Yap. Officials of the Yap State Government and the National Government are on board to make their joint assessments. The Yap State field trip vessel, HAPILMOHOL 1, departed Colonia, Yap on Wednesday, March 2nd, with over 300 cases of available bottled water in the local stores for the residents of four of the Yap Outer Islands whose supply of drinking water will not last beyond two weeks. The field trip vessel, MS MICRONESIAN NAVIGATOR, had also departed Pohnpei on Saturday, March 5th, with about 4,000 cases of bottled water destined for the Western Islands in the Northwest region of Chuuk State as well as the Outer Islands of Yap. The field trip vessel, MS CAROLINE VOYAGER, will depart Weno, Chuuk on Tuesday, March 8th, to the rest of the Northwest region of Chuuk State to distribute over 1,000 cases of bottled water for the residents of the islands and undertake assessment of water conditions. On the recent voyage of the MS MICRONESIAN NAVIGATOR from Weno, Chuuk through the Mortlocks Islands and on to Pohnpei, the crew carried out spot check assessment of the water conditions on the islands there. One of the patrol boats will carry assessors to Sapwuafik, Nukuoro, and Kapingamarangi, the southernmost island in Pohnpei State, to conduct similar assessments for the same purpose. Following these assessment missions, the Office of Environment and Emergency Management of the FSM Government will follow through with any required additional aid to ensure the welfare and safety of people residing on all affected islands of the federation. 4 March 2016 - The five FSM Chief Executives – FSM President Peter M. Christian, Chuuk State Governor Johnson Elimo, Yap State Governor Tony Ganngiyan, Pohnpei State Governor Marcelo Peterson and Kosrae State Lt. 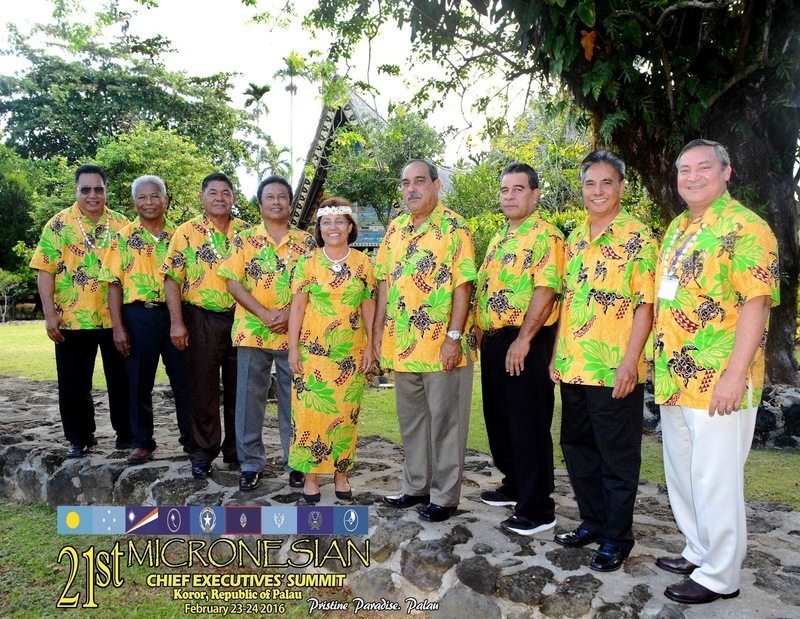 Governor Carson Sigrah – led their respective delegations to Koror, Republic of Palau, for the 21st Micronesian Chief Executives’ Summit (MCES) from February 23 - 24, 2016. This was the 21st session of the MCES where the three Presidents of the Republic of Palau, Federated States of Micronesia and Republic of the Marshall Islands, four Governors of Territory of Guam, Chuuk State, Yap State, Pohnpei State and two Lt. Governors of Kosrae State and Commonwealth of the Northern Mariana Islands met to reaffirm the commitments of each of the Chief Executives on behalf of their people and their governments, to establish closer ties, ensure future discussions and agree on implementing initiatives for the benefit of citizens in this Micronesian Region. The Summit was opened by outgoing Chairman of the 20th MCES, Yap Governor Ganngiyan, on the morning of February 23, 2016 and passed onto the incoming Chairman of the 21st MCES, Palau President Tommy E. Remengesau, Jr., who officially called the 21st MCES Session to order and began his opening statement with a moment of silence in remembering the people of Fiji in the aftermath of Cyclone Winston. He also noted with honor that the first female Micronesian Chief Executive, RMI President Hilda Heine, made this 21st MCES her first official trip outside of RMI. Subsequently, FSM President Christian, RMI President Heine, Guam Governor Eddie Baza Calvo, Chuuk Governor Elimo, Yap Governor Ganngiyan, Pohnpei Governor Peterson, Kosrae Lt. Governor Sigrah, and CNMI Lt. Governor Victor Borja Hocog gave their opening remarks. The reports and recommendations from the nine standing committees were given, along with presentations on a number of issues of interest in the region and jointly directed action in the MCES respective jurisdictions and are reflected in the 21st MCES Communiqué. The Summit concluded on February 24, with the Leaders Communiqué signing ceremony, and an announcement that the 22nd MCES will be held in Guam. While in Palau, FSM President, Chuuk, Yap and Pohnpei State Governors and Kosrae Lt. Governor also met with the FSM Honorary Consul to Palau, Mrs. Chen Masang and the FSM students who are attending Palau Community College. Accompanying the President, State Governors and Lt. Governor to the Summit were officials and representatives from the national and state offices, national agencies and national enterprises. For further information, contact FSM Department of Resources and Development via email: fsmrd@fsmrd.fm or telephone: +691 320-2620/2646/5133. President Peter M. Christian led the FSM delegation to Koror, Republic of Palau, for the 16th Micronesian Presidents’ Summit (MPS) which convened on Monday, February 22, 2016. 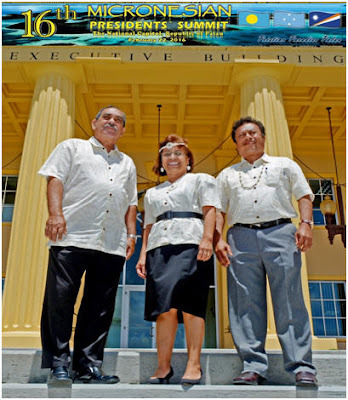 This marked the 16th year of the MPS for the Presidents of the Republic of Palau, the Federated States of Micronesia, and the Republic of the Marshall Islands. The annual meeting seeks to reaffirm and recommit to the strong ties and relations that have historically existed between the three Micronesian countries. It also provides a valuable opportunity for the three Presidents to discuss, share, and address issues of national, regional, and international interest. In his opening remarks, President Christian joined President Tommy E. Remengesau Jr. of the Republic of Palau in congratulating and welcoming newly elected President Hilda C. Heine of the Republic of the Marshall Islands to her first MPS. Among other issues discussed in the Summit, President Christian highlighted the need for continued cooperation and harmonization of the countries’ Immigration and Labor Laws. The President also took the opportunity to announce a recent change in FSM immigration regulations wherein citizens of RMI and Palau are no longer subject to the 120 day passport validity when entering the FSM. He also highlighted concerns of illegal immigrants entering MPS country jurisdictions, and after some discussions, the three Presidents agreed to continue their joint cooperation and diligent efforts in securing and monitoring these activities in their respective countries. The 16th MPS also focused on the climate change issue, particularly the recent Paris Climate Change Agreement and agreed to work with their respective legislatures to ratify the Paris Agreement as soon as practicable. Following the conclusion of the MPS, the President Christian also attended the 21st Micronesian Chief Executives’ Summit which was also held in Palau a day after the MPS. While in Palau, the President also met with the FSM Honorary Consul to Palau, Mrs. Chen Masang and the FSM students who are attending Palau Community College. Accompanying the President to the Summits were Secretary Lorin S. Robert, Department Foreign Affairs, Secretary Marion Henry, Department of Resources & Development, Secretary Joses Gallen, Department of Justice, Chief of Staff Leo Falcam, Jr., Special Assistant and Advisor Dohsis Halbert, Office of the President and other officials and representatives from the national offices and agencies.